The judgment is the largest Risperdal verdict awarded to a gynecomastia victim so far in the Pennsylvania mass tort program. In finding for the plaintiff, the jury determined that Johnson & Johnson and its Janssen Pharmaceuticals unit failed to provide adequate warnings regarding the association between Risperdal and gynecomastia. The plaintiff, who is now 16, began taking Risperdal in 2003, when he was just 5-years-old. At the time, the drug had not been approved for any pediatric indications. "This is the fifth time a Pennsylvania jury has found that Johnson & Johnson failed to provide appropriate warnings regarding Risperdal and male breast growth, and the fourth time a plaintiff has been awarded significant financial damages. We are extremely pleased and encouraged by this verdict," said Sandy A. Liebhard, a partner at Bernstein Liebhard LLP, a nationwide law firm representing the victims of defective drugs and medical devices. The Firm is currently representing a number of Risperdal plaintiffs, and continues to provide free legal reviews to individuals who allegedly developed gynecomastia due to their use of the antipsychotic medication. Court records also indicate that settlements have been reached in a number of other Risperdal gynecomastia lawsuits that had been pending in the Pennsylvania litigation. Risperdal patients who allegedly developed gynecomastia connected with its use may be eligible to file their own lawsuit. 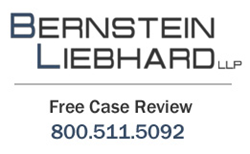 To find out more, please contact Bernstein Liebhard LLP by visiting the Firm's website, or by calling 800-511-5092.